It was a beautiful day, with temperatures already in the mid-40’s and rising. Perfect for a bike/skate BRICK, with a 30 mile mountain bike run from BWI airport to Annapolis…followed by a 12.5 mile skate loop around the airport. 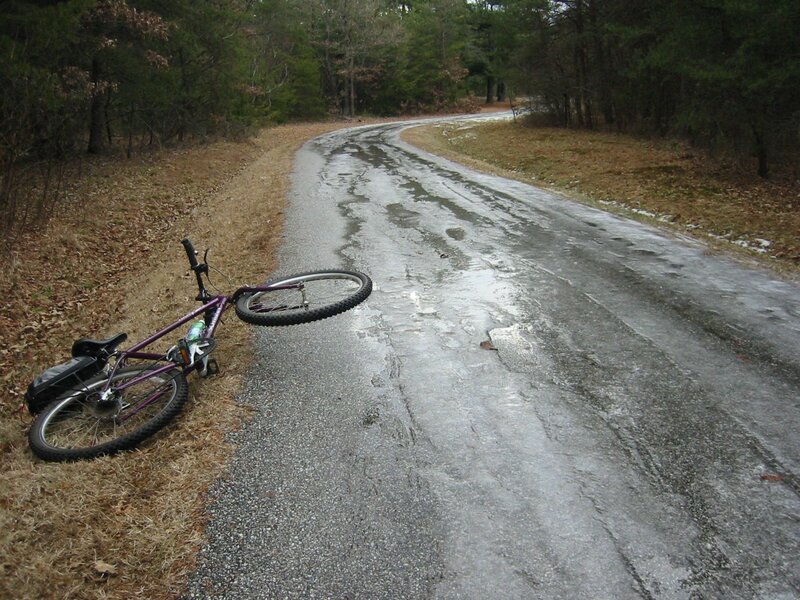 Somewhere around the first 3/10ths of a mile into the bike ride, with patches of ice appearing out of nowhere, my bike partner began fantasizing about an Olympic performance. She does this occasionally. Meet Dorothy ‘Jilly’ Hamill…as the skate world does biker freestyle (captured on camera) — demonstrating the fine points of an acrobatic triple sow cow camel spin back flip with a toe plant using the front wheel with a left rotation completely unhinged by the derailleur. Holy crap….can we see that again? Wait — let me get this picture. Got it. Now, are you OK partner?? Despite the mangled look, our performer was unhurt, tho the bike wasn’t so lucky.